A round-up of the action from day three of the Commonwealth Games on the Gold Coast. Day three of the Commonwealth Games brought another gold medal for Neil Fachie and pilot Matt Rotherham. Scotland's first gold medal winners of the 2018 Games added to their success with victory in the men's blind and visually impaired sprint on Saturday morning. Fachie and Rotherham had broken the world record on their way to the final and didn't disappoint with medals on the line, beating Wales' James Ball and Peter Mitchell. Katie Archibald added to her gold medal with a silver in the women's point race, with fellow Scot Neah Evans taking bronze. 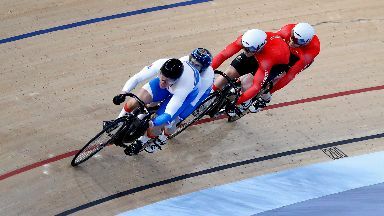 And Jack Carlin took silver in the men's sprint, losing out to New Zealand's Sam Webster. Callum Skinner was ill overnight and was unable to compete. In the pool, Duncan Scott took bronze for Scotland in the men's 200m butterfly. A strong final push saw him finish in 1:56:50 to take third place behind Australia's David Morgan and winner Chad de Clos from South Africa. Scott has added to the bronze he won in the 200m freestyle on Friday. Ross Murdoch and Craig Benson finished fifth and sixth respectively in the 100m breaststroke. Kathleen Dawson took sixth place in the 100m backstroke. Scotland's Frank Baines narrowly missed out on a medal in the men's gymnastics all-round final, finishing fourth. In the women's boxing, teenager Vicki Glover is through to the quarter-finals after beating Dominica's Valerian Spencer. She'll now face Sabrina Aubin-Boucher of Canada in the next stage. In the men's 69kg Stephen Newns reached the quarter-finals with a unanimous points victory over Curlun Richardson of Anguilla. Scotland suffered disappointment in the men's hockey, losing 1-0 to Canada . The team face Australia on Saturday night, with one win and one defeat in Pool A so far.